Additionally, Lorde’s headlining comes in the midst of her hinting at the sound of her sophomore album “Melodrama” since earlier this year, which is set to be released in June. The festival announced the line-up with a dynamic video featuring clips from previous years’ festivals against the background song “Certainty” by this year’s performer English rock-band Temples. Atop its stacked set-list, Outside Lands will also feature a comedy lineup, which has not yet been announced. The music and arts festival will also feature a variety of food and drink options from Bay Area restaurants, wineries and breweries. Tickets for Outside Lands go on sale Apr. 6 at 10 a.m. PT through the festival’s website. Festival-goers have the option to purchase either a general admission ticket, which provides access to the array of music, comedy, food and drink; or a VIP ticket, which allows special privileges to the festival’s exclusive Polo Club, special stage access, and more. The Who, Metallica, Gorillaz, Lorde and A Tribe Called Quest top the stacked lineup for the 10th installment of Outside Lands. The festival will take place August 11th through 13th at Golden Gate Park in San Francisco. 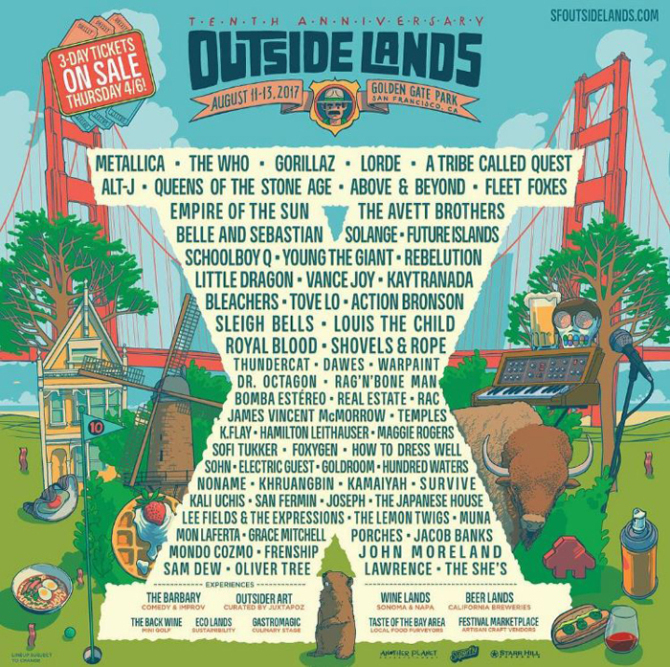 Outside Lands will also feature Queens of the Stone Age – marking their first scheduled North American show of 2017 – as well as alt-J, Fleet Foxes, Solange, Empire of the Sun, Above and Beyond, the Avett Brothers, Belle and Sebastian, Future Islands Schoolboy Q, Young the Giant, Vance Joy, Bleachers, Tove Lo, Action Bronson, Thundercat, Sleigh Bells, Hamilton Leithauser, Foxygen, How to Dress Well, Porches, Noname and Kamaiyah. Tickets for Outside Lands go on sale April 6th at 10 a.m. PT via the festival's website. Outside Lands announced its 2017 lineup in a vibrant clip featuring footage from past events and the peppy psych-pop track "Certainty," from festival performers Temples. Along with its many music offerings, Outside Lands will once again feature a comedy lineup, though performers have yet to be announced. The festival will also boast an array of food and drink options from Bay Area restaurants, wineries and breweries. For festival headliners the Who, the Outside Lands gig will take place immediately after their scheduled Las Vegas residency, which begins July 29th and wraps August 11th. While the group is set to end their "last big tour" with several rescheduled shows in England this month, guitarist Pete Townshend suggested to Rolling Stone that they would continue to perform live, noting the excitement he felt playing to crowds comprised mostly of millennials. Meanwhile, Metallica will play the festival at the tail end of their North American tour in support of Hardwired... to Self-Destruct, while Outside Lands marks another festival appearance for Lorde, who will release her long-awaited album, Melodrama, June 16th. Outside Lands is also currently the only North American date Gorillaz have scheduled as they prepare to release their new album, Humanz, April 28th. 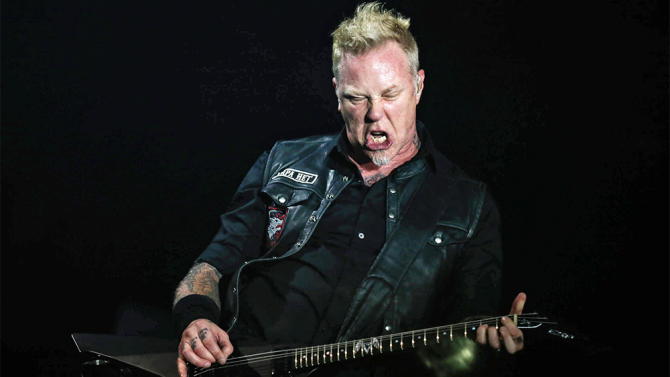 0 Response to "Outside Lands 2017: Metallica, The Who, Gorillaz, Lorde to Headline"